GREAT TASTING PROTEIN SHAKE WITH ADDED GREENS! 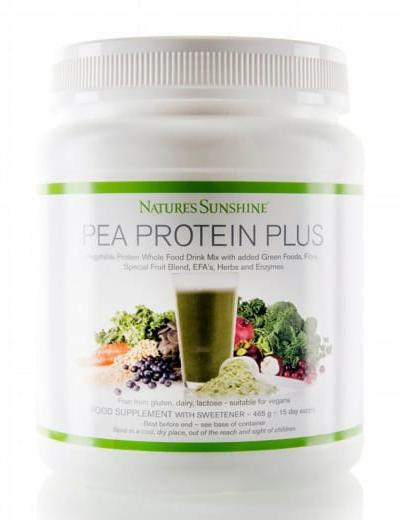 Pea Protein Plus is a great tasting, vegetable protein drink mix that provides a superb nutritious blend and boasts a brilliant nutritional profile, in a fantastic low carbohydrate combination that is free from dairy, gluten and lactose, and contains NO saturated fat or cholesterol. Pea Protein Plus is a great alternative to dairy protein, and provides an excellent source of high quality vegetable protein made from yellow split peas, plus adzuki beans, black beans, garbanzo beans and brown rice protein. This formula also contains a superb range of antioxidant rich ingredients including mangosteen, goji, watermelon, blueberry, cranberry, grape skin, grape seed, pomegranate, acerola and lemon bioflavonoid. Provides generous amounts of 18 vitamins and minerals. Natural fruit blend rich in antioxidants. Includes essential fatty acids, herbs, fibre and enzyme blend. Dairy-free, Lactose free, Gluten free. With a range of B vitamins for energy, Pea Protein Plus contains only 110 calories and 10g of carbohydrate per serving. Mix two level scoops of Pea Protein Powder with approximately 8oz of water and shake vigorously. One 30g serving when mixed with water provides 13g of protein. When combined with skimmed milk one serving provides 21g of protein.